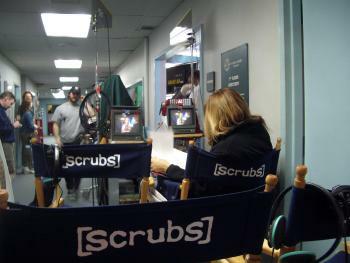 Shooting information from episode "My Fault"
On a single camera show the shooting schedule is arranged to minimize production costs, grouping scenes by set location and talent requirements, rather than filming in storyboard sequence. This can be a complex logistical undertaking and it must be interesting to figure it all out every week. The Monday we were visiting was the first day of the shoot. All of the day's scenes took place on the first floor. The morning scenes were set in admissions, featuring John C., Ken, and Richard. Sarh shot her only scene in the afternoon with Zach, who was later joined by Donald, Judy, Robert and Tara for the afternoon cafeteria scenes. We had the opportunity to examine each of the above for "My Fault" during our visit. 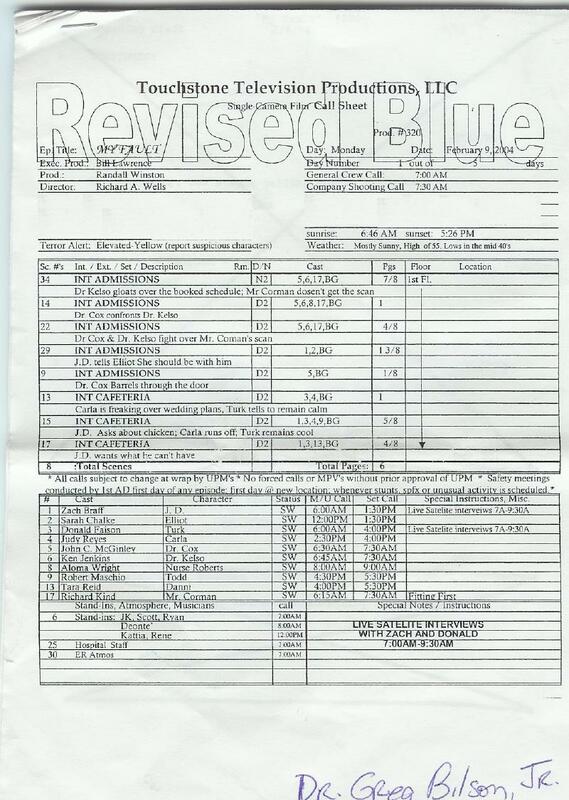 Some pages from the script sides and Tuesday's call sheet appear below, edited to remove some sensative information and phone numbers. (The images are large and may take some time to load). The script is the backbone document for any given production. There are usually multiple, color-coded, revision levels, documenting the dialogue, general stage directions and unique elements for all the scenes, in proper story sequence. All of the copies we saw on the set had specific names or departments on the cover and it was interesting to read some of the hand-written notes in some of them. During our tour of the building, we saw that most offices had a copy in their mail box with a cover sheet attached detailing specific instructions and/or requirements for that department. 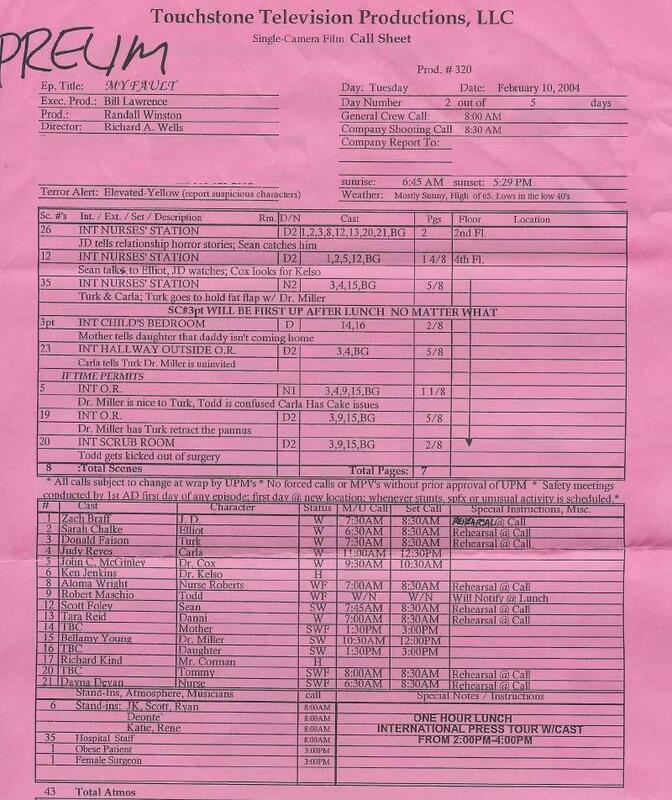 The pink shooting scripts for "My Fault" were about fifty pages, including a cast list and scene summary. That sounds like a lot, but there is actually very little dialogue on each page, so the script was a very quick read. Sides are the daily "cheat sheet" version of the script. 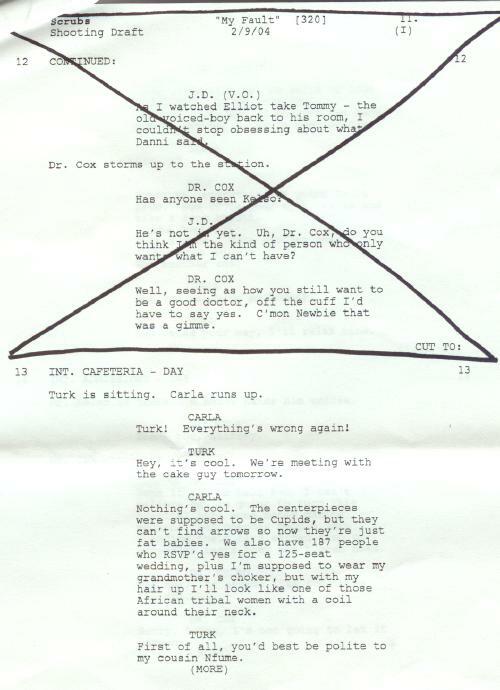 Pages that contain the scenes being shot that day are stapled together with a copy of the day's call sheet. 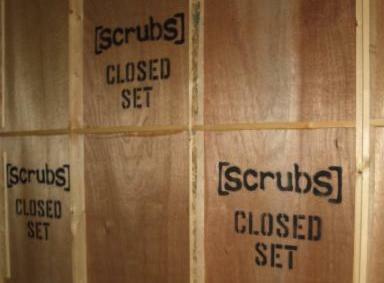 Any dialogue or directions for scenes not on the day's shooting schedule are crossed out with black magic marker. They must print a boatload of them - it seemed every time I went to Video Village, someone asked me if I wanted a copy. Remarkably, I managed to keep track of my single copy through the entire day. The pages are printed half-size and the resulting packet fit very nicely into the pocket of my lab coat, along with some napkins, a bottle of water, and my camera. Each day, a legal-sized call sheet is distributed to all the cast and crew that summarizes the following day's shooting order and cast call times, along with general information for the company and a preliminary scene schedule for the following day. One the reverse is a listing of all departments and company members with any equipment requirements or special instructions noted (e.g. how many meals are required from catering that day). Lyda was passing out the prelimiary call sheets for Tuesday about two o'clock on Monday afternoon. If I'd realized that "Extra" was going to be filming Dayna Devlin's appearance on Tuesday, I might have come back to see that. But Danny had been right - Monday was the best day in the shooting schedule for background work. I was sitting in one of the purple chairs just outside the gift shop during Scene 14. During a break between takes, Richard walked over to talk with the cameraman and handed me a notebook as he passed by. I wasn't exactly sure why he did, or even if he realized he had, but it was interesting to flip through and see some of the detail and planning that goes into an episode. Inside the three-ring binder was his annoted copy of the script, detailed set diagrams for each scene with blocking information and notes on various aspects of the production. Richard moved on to take care of something else, but I didn't move from that seat until he came back for the binder. the full script with her wherever Video Village was set up. Text from Scubs episode "My Fault" copyright 2004 by Touchtone Television. Unless otherwise identified, all text, pictures and video on this site is copyright 2004 by justbecauseican.com and may not be downloaded or otherwise used without written permission. All ownership claims are subordinate to those of the production company, Touchtone Television and NBC. Comments? Send me an e-mail. This page best viewed in a maximized browser window at a resolution of 1024x768 or better.